To Cite: Khadem Ansari M H, Omrani M, Kheradmand F. Oxidative Stress Response in Patients Infected by Diverse Hepatitis C Virus Genotypes, Hepat Mon. 2015 ; 15(2):e22069. doi: 10.5812/hepatmon.22069. Background: The molecular mechanism of hepatitis C-virus (HCV) genome-specific pathogenesis remains unclear. Oxidative stress is an important pathophysiological mechanism in chronic HCV infection, but its relation to HCV genotypes has not been thoroughly examined. Objectives: In the present case-control study, the effect of diverse HCV genotypes on oxidative status changes was investigated. Patients and Methods: From 310 patients examined by enzyme immunoassay and PCR, 160 patients with positive results for HCV with previously determined genotypes were chosen. For the control group, 160 first time blood donors referred to the Regional Blood Transfusion organization of the West Azerbaijan province, northwestern Iran were selected. Oxidative stress markers such as total antioxidant status (TAS), serum levels of reduced (GSH) and oxidized (GSSG) glutathione, Gamma-glutamyl transferase (GGT) and malondialdehyde (MDA) were evaluated in patients infected with diverse HCV genotypes and those in the control group. Results: In the patient and control groups, the mean ± SE of TAS, GSH, GSSG, GGT and MDA were 1.04 ± 0.35 vs. 2.68 ± 0.77, 1.25 ± 0.37 vs. 3.12 ± 0.58, 0.20 ± 0.05 vs. 0.08 ± 0.04, 26.82 ± 5.62 vs 8.28 ± 2.03 and 2.56 ± 0.60 vs. 0.93 ± 0.34. All markers had statistical difference between the two groups (P <0.05). 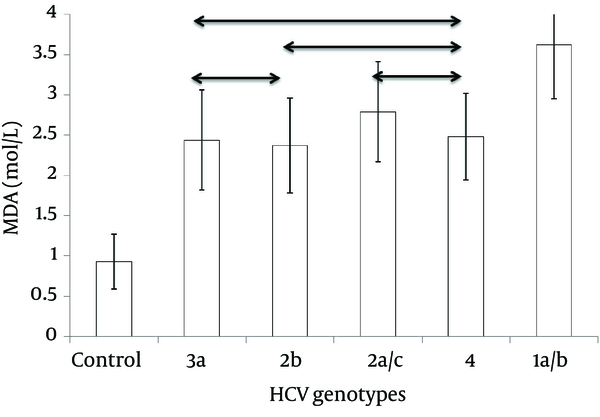 Obvious differences were found in oxidant/antioxidant balance among diverse HCV genotypes with an ascending trend in antioxidant levels among patients infected with genotypes 1a/b, 4, 2a/c, 2b, 3a and healthy controls and a vice versa trend in measures of oxidative markers except for malondialdehyde with a variable pattern. Conclusions: More serious disease in HCV genetic subtype 1a/1b might be associated with more severe oxidative stress. Milder damage in subtypes 4, 2a/c, 2b and 3a could be related to lower oxidative response, respectively. A combination of antiviral and antioxidative therapies may enhance the overall response rate of patients with HCV infection, especially with more destructive genotypes. Infection with hepatitis C virus [(Family Flaviviridae, Genus Hepacivirus, Species Hepatitis C virus), (HCV)] has become a global health problem. The WHO estimate of the prevalence of HCV infection is 2%, representing 123 million people worldwide (1). This single-stranded RNA virus causes both acute and chronic hepatitis. Although Chronic HCV is a benign viral infection in most patients, it has been known as the principal cause of cirrhosis, hepatocellular carcinoma, extrahepatic diseases and the leading indication for liver transplantation in the developed world (2-4). The molecular mechanism of HCV pathogenesis and the cause of progression of liver disease to severe liver injury are still poorly understood. Oxidative stress has emerged as a key player in the development and pathogenesis of chronic HCV (2, 5, 6). HCV displays a remarkable degree of genomic diversity and background genotyping of HCV has become an essential tool for prognosis and prediction of treatment duration (7). At least 11 genotypes and 70 subtypes were described worldwide from which five HCV genotypes (1a/b, 2a/c, 4, 2b and 3a) were reported in West Azerbaijan province (8, 9). It has been reported that sensitivity to antiviral therapy varies between genotypes and even within each genotype (10-12). To the best of authors’ knowledge, there are few investigations regarding oxidative status and background genotyping. Thus, in the current study, total antioxidant status (TAS), serum levels of reduced (GSH) and oxidized (GSSG) glutathione, Gamma-glutamyl transferase (GGT) and malondialdehyde (MDA) were analyzed in patients infected with diverse HCV genotypes. A case-control study was performed on outpatients referred to a private medical laboratory in the West Azerbaijan province, northwestern Iran. From 2006 to 2008, of 310 examined patients whose blood samples were tested with both enzyme immunoassay (EIA) and PCR, 128 (41.3%) had negative results for EIA . Among 182 remaining patients with positive results for EIA, 22 had negative results in PCR. Therefore, 160 patients with positive results by both PCR and EIA method with determined genotypes (9) were selected. The inclusion criteria were adult patients [age 20-50 years, either gender (males or females)] who were new cases and had normal liver transaminases. The exclusion criteria were patients with other chronic medical disorders or with previous HCV treatment history. Besides, those who refused to participate were excluded from the study. The control group consisted of 160 age- and gender-matched blood donors referred to the Regional Blood Transfusion Organization. Ethical approval to perform this study was obtained from the local ethics committee of Urmia pathobiology center. Serum of patients and control group was separated using bench type centrifugation method and frozen at -40 °C for future oxidative status evaluation by one observer. Serum TAS was measured usinga Hitachi Analyzer with a Randox reagent kit (Randox Laboratories Ltd, UK). Control samples were obtained from the same company. The determination is based on the reaction of ABTS (2,2-Azino-di-[3-ethylbenzthiazoline sulfonate]) with a peroxidase (metmyoglobin) and H2O2 to produce the radical cation ABTS+. Antioxidants in the serum suppress cation ABTS+ to a degree that is proportional to their concentration. This cation has a fairly stable blue–green color, which is measured at 600 nm. GSH concentration was determined using a Microplate Assay kit (Oxford Biomedical Research Inc.) and an Awerness microplate reader (Molecular Devices, Sunnyvale, CA). In this assay, the reaction of GSH with Ellman’s reagent (5,5’-dithiobis-2-nitrobenzoic acid (DTNB)) gives rise to a product that can be quantified spectrophotometrically at 412 nm. This reaction is used to measure the reduction of GSSG to GSH. The rate of reaction is proportional to GSH and GSSG concentrations. Serum GGT was measured by commercial kit (Pars Azmoon, Tehran, Iran) using an autoanalyzer (Biotecnica, Targa 3000, Rome, Italy). Control serum (Randox control sera, Antrim, UK) was used to control the measurement accuracy. The GGT catalyses the transfer of γ-glutamyl moiety of L-γ-glutamyl-3-carboxy-4-nitranilide to glycylglycine, whereby L-γ-glutamyl-glycylglycine + 5-amino-2-nitrobenzoate are formed. Formation of 5-amino-2-nitrobenzoate, which serves as a measure of GGT activity was measured by spectrophotometry at 405 nm. MDA was measured by the modified thiobarbituric acid method described by Buege and Aust (13). In this method, thiobarbituric acid reactive substances concentration was calculated using 1.56×10-5 M-1 cm-1 as mol/L extraction coefficient. SPSS 16 (SPSS for windows ver.16) was used for statistical evaluation. One sample Kolmogorov–Smirnov test was used to assess the distribution characteristics of variables. Quantitative data were assessed using ANOVA with Tukey’s post hoc comparison of the means. Results were reported as mean ± SD. Probability values of less than 0.05 were considered as statistically significant. In the patient and control groups, the mean ± SE of TAS, GSH, GSSG, GGT and MDA were 1.04 ± 0.35 vs. 2.68 ± 0.77, 1.25 ± 0.37 vs. 3.12 ± 0.58, 0.20 ± 0.05 vs. 0.08 ± 0.04, 26.82 ± 5.62 vs. 8.28 ± 2.03 and 2.56 ± 0.60 vs. 0.93 ± 0.34 (P <0.05 for all markers). Previous genotyping results are displayed in Table 1 (9). The values of oxidative stress parameters in divers HCV genotypes are summarized in Table 2. As shown in this table, serum oxidative stress indicators were markedly enhanced and measures of antioxidants significantly declined in patients infected with HCV compared to control. Besides, measures of oxidative stress markers had similar patterns of variation in patients infected with diverse HCV genotypes. A decreasing trend was observed in the levels of TAS and GSH between patients infected with genotypes 1a/b, 4, 2a/c, 2b and 3a. In contrast, genotype 1a/b had highest levels of serum GSSG, GGT and MDA. aAbbreviations: GGT,gamma-glutamyl transferase; GSH, reduced glutathione; GSSG, oxidized glutathione; MDA, malondialdehyde;TAS, total antioxidant status. bData are expressed as mean ± SD. Data analysis by one-way ANOVA revealed a significant difference in TAS serum level between the groups (F = 141.09, P = 0.00). HCV-3a infected patients had the highest level of serum TAS inpatients groups (Table 2 and Figure 1). Figure 1. Total antioxidant status (TAS) in serum ofpatients infected with diverse HCV genotypes and the control group. Data are expressed as mean ± SD. Double arrows indicate groups of means that do not differ based on Tukey’s post hoc tests for significant ANOVA results. 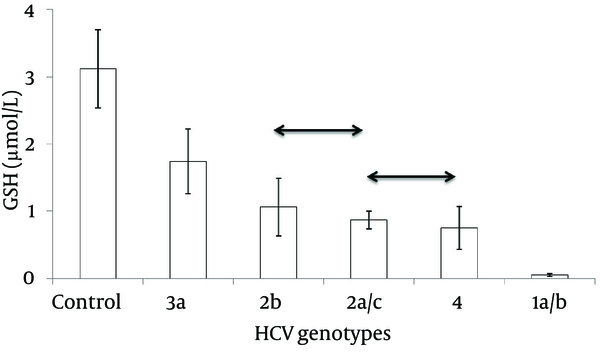 The biochemical level of GSH in diverse HCV genotypes as well as the control group were significantly different (F = 246.84, P = 0.00) with group 3a and 1a/b having the highest and lowest values, respectively (Table 2Figure 2). Figure 2. Reduced glutathione (GSH) in serum ofpatients infected with diverse HCV genotypes and control group. Data are expressed as mean ± SD. Double arrows indicate groups of means that do not differ based on Tukey’s post hoc tests for significant ANOVA results. Like other oxidative stress indicators, GSSG level was significantly different in diverse HCV genotypes as well as the control group (F = 29.48, P = 0.00) (Table 2 and Figure 3). Figure 3. Oxidized glutathione (GSSG) in serum ofpatients infected with diverse HCV genotypes and the control group. Data are expressed as mean ± SD. Double arrows indicate groups of means that do not differ based on Tukey’s post hoc tests for significant ANOVA results. There was a significant difference in GGT serum level between the groups (F = 480.79, P = 0.00). A decreasing trend was observed in the levels of GGT inpatients infected with genotypes 1a/b, 4, 2a/c, 2b, 3a and healthy controls (Table 2 and Figure 4). Figure 4. Gamma-glutamyl transferase (GGT) in serum ofpatients infected with diverse HCV genotypes and the control group. Data are expressed as mean ± SD. Double arrows indicate groups of means that do not differ based on Tukey’s post hoc tests for significant ANOVA results. Serum MDA concentration was significantly high in all HCV infected patients compared to controls (F = 178.89, P = 0.00), with group 1a/b having a significantly highest level (Table 2 and Figure 5). Figure 5. Malondialdehyde (MDA) in serum ofpatients infected with diverse HCV genotypes and the control group. Data are expressed as mean ± SD. Double arrows indicate groups of means that do not differ based on Tukey’s post hoc tests for significant ANOVA results. Oxidative stress has been proposed as a key step in the development and progression of liver damage (2, 14, 15). 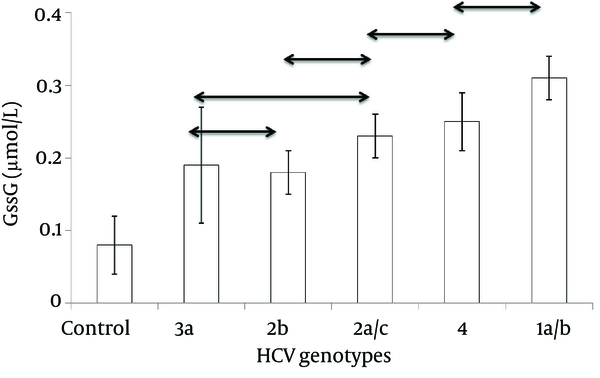 According to the results of this study, there were obvious differences in oxidant/antioxidant balance between diverse HCV genotypes with an ascending trend in antioxidant levels in patients infected with genotypes 1a/b, 4, 2a/c, 2b, 3a and healthy controls and a vice versa trend in measures of oxidative markers. For unknown reasons, MDA level had a variable pattern with subtle changes among diverse HCV genotypes. Unfortunately, detailed demographic data was unavailable, but the strong point of our study was that PCR-proven HCV infected patients were analyzed and patients were sampled before starting the treatment. Besides, the association of oxidative stress and background genotyping has been described only in few studies. Mahmood et al. found a significant reduction of hepatic, plasmatic and lymphocytic GSH levels in patients chronically infected by HCV, particularly the 1b genotype (16). In contrast, Jahan et al. 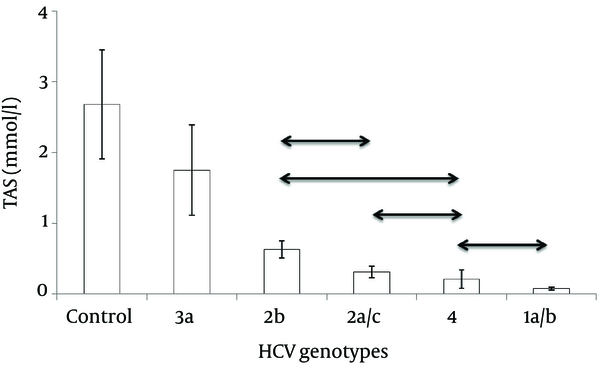 investigated the effects of HCV core protein on cellular genes in hepatocellular carcinoma cell line and reported high expression of oxidative stress related genes in patients infected with HCV genotype 3a compared to 1a (17). This conflict may arise from involvement of host or other viral factors. Increased oxidative stress and decreased antioxidant levels in chronic hepatitis C patients have been reported in many studies (18-21). Cunningham-Rundles et al. reported that levels of oxidative markers like MDA have been correlated with the severity of chronic hepatitis (22). Because of increased oxidative stress in patients infected with genotypes 1 and 4 in the present study, these genotypes seem to cause more severe disease. Accordingly, Resti et al. reported that HCV genotype 1 is associated with more severe disease, compared with genotypes 2 and 3 (23). Genotypes 2 and 3 also have been reported to be more resistant to antiviral therapy than genotypes 1 and 4. Besides, long-term response rate in individuals infected with genotypes 1 and 4 has been shown to be much lower than the rates of genotypes 2 and 3 (10, 24-26). Surprisingly and in contrast to the results of current study, steatosis and severe disease has been reported to be more prevalent in patients infected with HCV genotype 3. However, the mechanism involved in HCV induced steatosis is still not clear (27-29). From the viewpoint of HCV genetic subtypes, Amoroso et al. showed a greater rate of evolution to chronicity and more severe liver disease after acute exposure to HCV genetic subtype 1b infection (30). Similarly, some reports proposed a possible link to hepatocellular carcinoma and genetic subtype 1b. 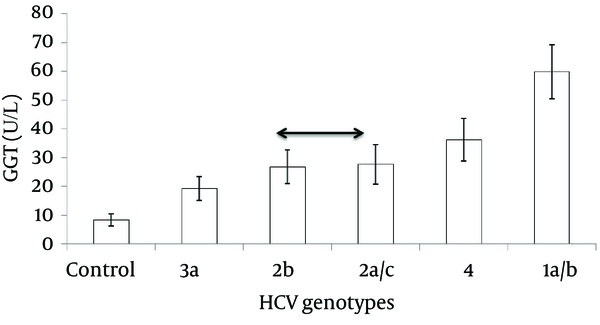 HCV genetic subtype 1b also has been mentioned to be associated with earlier recurrence and more severe hepatitis after liver transplantation compared to the other genotypes (10, 31, 32). As a result of more severe oxidative stress in HCV genetic subtype 1a/1b in the present study, this subtype seems to cause more serious disease in contrast to other subtypes. Although differences in the pathogenicity of genotypes are not clear, genotype has been proved to be one of the key predictors of response to antiviral therapy. Because of genotype-specific differences in response to the new generation of antiviral agents, HCV genotyping can assist in the management of patients and planning for appropriate strategies, particularly the length of treatment (10, 31). Moreover, due to the role of oxidative stress in HCV pathogenesis, antioxidants have been proposed in combination with standard treatmentregimens (33). It seems that antioxidant supplementation, especially in patients with resistant genotypes, may result in more favorable outcomes. However, Groenbaek et al. showed that supplementation with vitamin C, E and selenium increased the antioxidant status, but had no effects on viral load or oxidative markers (34). The efficacy of antiviral treatments particularly in patients with resistant genotypes could be the subject of future studies. The authors would like to thank members of Urmia pathobiology center for supporting this study. We also appreciate all patients with chronic hepatitis C and healthy controls who participated in this study. Authors’ Contributions: Mohammad Hassan Khadem Ansari and Mir-Davood Omrani developed the original idea, analyzed and interpreted data. Fatemeh Kheradmand contributed to statistical analysis,abstraction of data and preparation of the manuscript. Funding/Support: The financial support by Urmia pathobiology center is gratefully acknowledged.